The U.S. Forest Service has an ambitious plan to change the trail system at Fallen Leaf Lake. The changes are needed to protect sensitive habitats, improve water quality, and improve recreation. The total project effects 45 miles of trails. 12 miles would be upgraded, 14.5 miles would be decommissioned, 5 miles would be reconstructed and 5 new miles would be added. Parking areas would be upgraded and several new parking areas would be added. 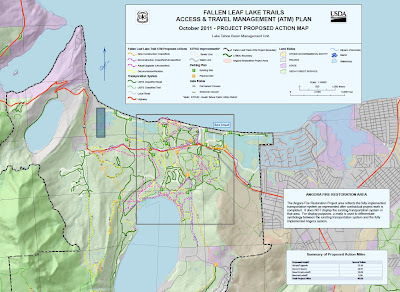 Click on this link to review the “Fallen Leaf Lake Trail Access and Travel Management Plan“. The Forest Service will accept comments through Friday, October 12, 2012. The phone number for the Forest Supervisor’s Office is 530-543-2694.